The AirCore is an innovative atmospheric sampling system that consists of a long tubing, usually in the shape of a coil, that can sample the surrounding atmosphere and preserve a profile of the trace gas of interest from the middle stratospher to the ground. The narrow diameter and long length are designed to minimize the diffusive mixing occuring inside the tubing between sampling and analysis. For more information, contact Colm Sweeney. 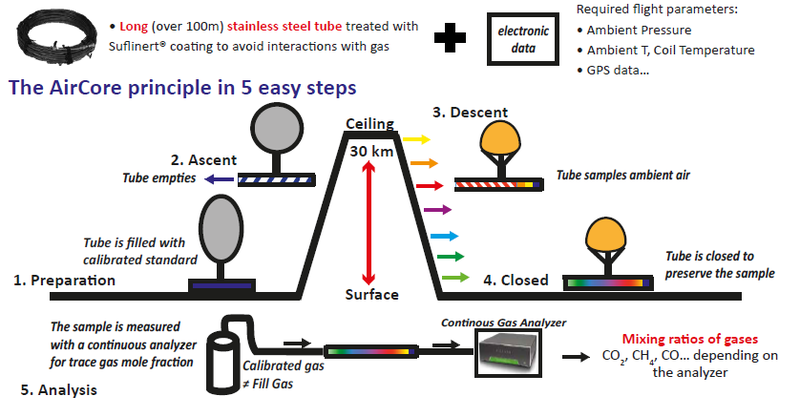 Firstly, the valves at either end of the stainless-steel tubing are purged and dried and then the tube is filled with a gas of known concentration (colored blue on above figure). This is called the ‘fill gas’. This both purges and dries the AirCore and prepares it for analysis later. Depending on the length of the tubing, this takes around 20 minutes. Running a fill gas through the tubing also allows the checking of faults and leaks. A second AirCore is purged, as flying two at the same time allows cross-checking of samples in case one AirCore develops a fault during flight. Upon ascent with a valve open on one end, the ‘fill gas’ evacuates the tube to the minimum ambient pressure encountered. When the AirCore has reached 95,000ft (30km), approximately 99% of the ‘fill gas’ has evacuated from the tube. 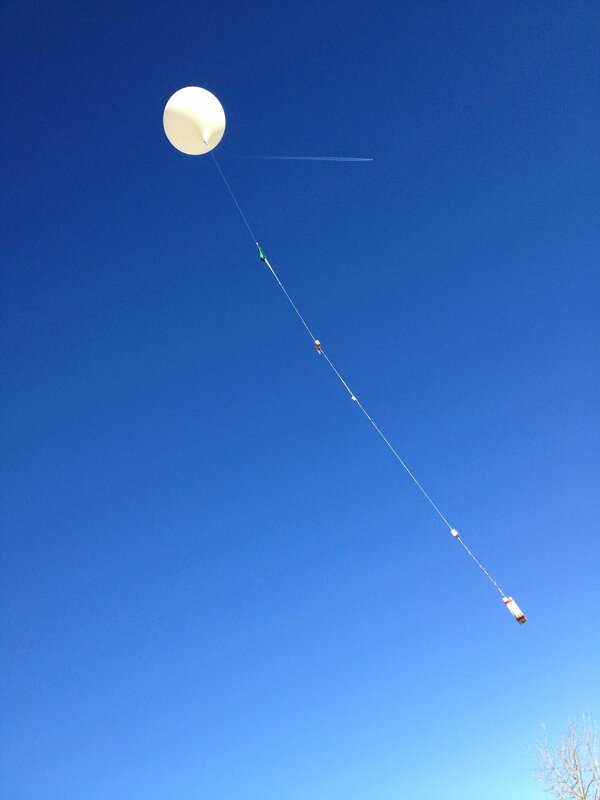 At this point, monitoring sensors detect that the AirCore has reached peak height and a cutter is activated to sever the payload from the balloon. While descending, the tubing equalizes with ambient pressure, filling slowly with surrounding air (rainbow colors), first passing through a small magnesium perchlorate filled canister attached to the open valve to remove moisture. The open valve closes when sensors detect that the AirCore has landed, sealing the tube and preserving the sample. Analyzing the second of the two AirCores flown allows for verification. Confidence in the samples collected will be shown by the analyzer read-outs for both AirCores being mostly identical. The AirCore was validated by carrying it on-board a light aircraft along with flasks and a Picarro CRDS CO2/CH4 analyzer. The three systems pulled in air through their own separate inlet systems. Results show no overall bias with respect to flasks; 66% of offsets between the systems were within 0.3 ppm of CO2 and 5 ppb of CH4. On September 10, 2011, NOAA and CIRES scientists and engineers teamed up with Edge of Space Sciences (www.eoss.org) to launch three separate balloons with AirCore payloads. 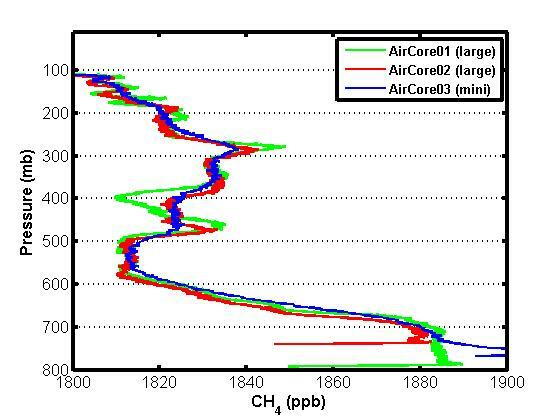 The main objective of these launches was to determine the level of agreement between the trace gas profiles for the three AirCores, and whether any differences were due to real atmospheric variability or due to differences in the AirCore samplers. The balloons had different burst altitudes ranging from 25 to 30 km and varied in their descent locations by between 5 and 10 km. The AirCores themselves also varied in their coating material and overall size. 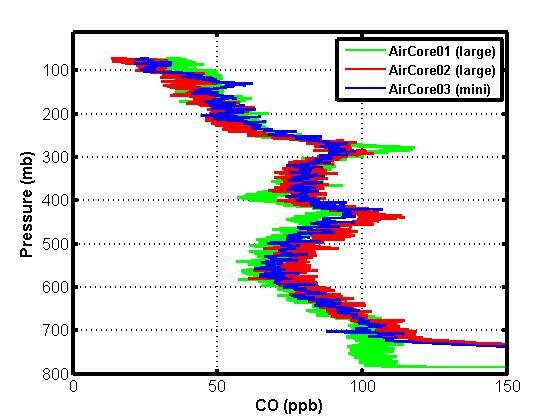 The figures show the profiles for CO2, CH4, and CO, as measured post-flight with a Picarro 4-species analyzer (model G2401). 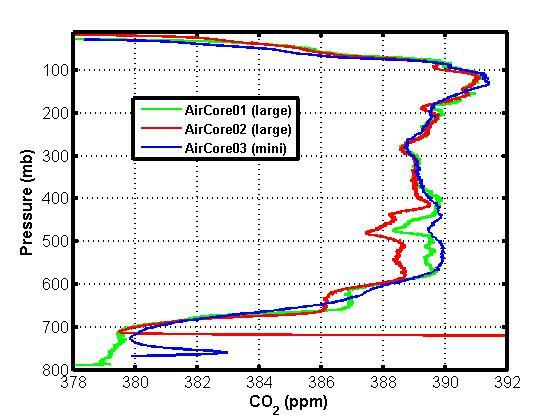 The second objective of the launches was to demonstrate the capability of the AirCore to sample the full column of the atmosphere and obtain accurate and precise measurements that can be compared and used for validation of satellite products, such as CO2 column means retrieved from NASA's Orbiting Carbon Observatory. This video produced in October 2017 shows the AirCore sampling system from preparation to analysis. The AirCore Atmospheric Sampling System has continued to gain traction, and there are now organizations worldwide developing it further including, but not exclusively, in the UK (University of East Anglia), the Netherlands (University of Groningen), France (Laboratoire de Météorologie Dynamique) and Finland (Finnish Meteorological Institute). The latest developmental step is to create an ‘active’ AirCore where, as opposed to passively sampling air from the equalizing of pressure, atmospheric air samples are collected using a pump to pull the air through the tube during flight. This opens up the possibility to sample atmospheric air in both vertical and horizontal planes. Such a system can be mounted on aircraft or UAV drones. For more information see Andersen et el. 2017, A UAV-based active AirCore system for accurate measurements of greenhouse gases, Atmos. Meas. Tech. Discuss. 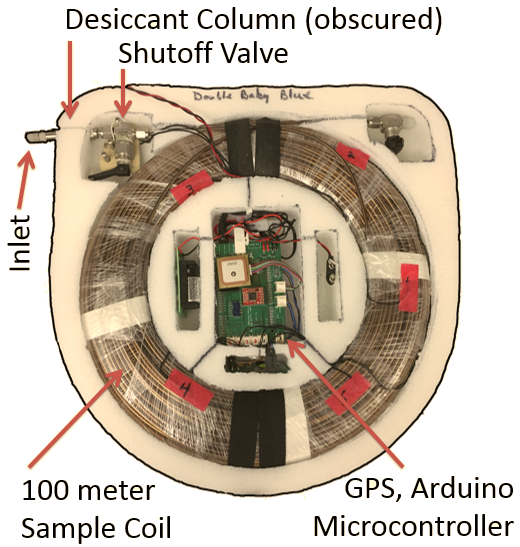 Andersen, T., Scheeren, B., Peters, W., and Chen, H. (2017) A UAV-based active AirCore system for accurate measurements of greenhouse gases, Atmospheric Measurement Techniques Discuss. Karion, A., Sweeney, C., Tans, P., and Newberger, T., (2010) AirCore: An Innovative Atmospheric Sampling System, Journal of Atmospheric and Oceanic Technology, Nov. 2010, doi: 10.1175/2010JTECHA1448.1.